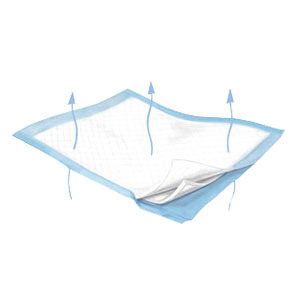 Maxiflo™ Breathable Underpads are specifically designed to help prevent skin breakdown for bed-bound patients. The Maxiflo™ Underpad is great for low air loss beds or where breathability is important. Excellent absorbency, dryness and strength. Spunbond, nonwoven backing helps prevent skin breakdown on low air loss beds. Contains Poly-Fresh™ super absorbent polymer providing excellent fluid retention, improved dryness and odor reduction. Generous size providing ample bed coverage. Superior strength in construction prevents tearing.